Seth Meyers lands at "Late Night"
The last piece of NBC's big talk-show turnover will fall into place Monday when Seth Meyers debuts as host of "Late Night." Meyers, who until early this month was a "Saturday Night Live" veteran and co-anchor of its "Weekend Update" newscast, is filling the vacancy left by Jimmy Fallon after five years hosting "Late Night." Fallon, of course, moved up last week to be host of "The Tonight Show," replacing Jay Leno -- and kicked off his stint with solid ratings and a slew of star-studded guests ranging from Michelle Obama to Lady Gaga. 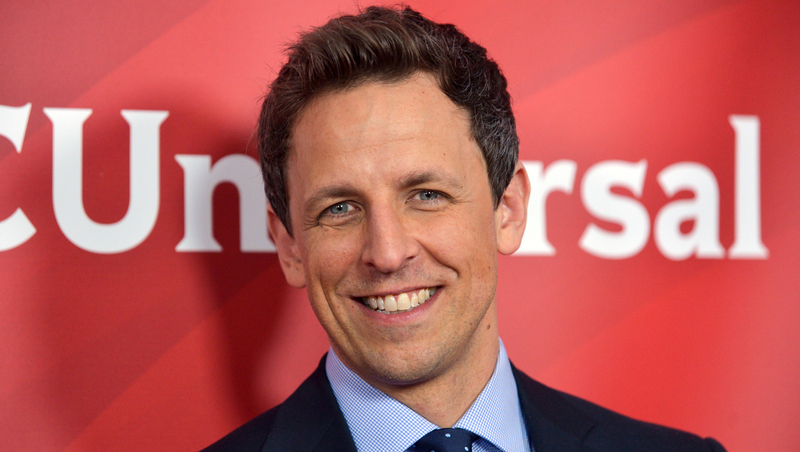 Based in New York (as is the newly relocated "Tonight"), "Late Night with Seth Meyers" airs at 12:35 a.m. EST/11:35 p.m. CST, with a roster of scheduled guests for its premiere including Vice President Joe Biden, Meyers' former "Weekend Update" desk mate Amy Poehler and the band A Great Big World. Another "SNL" alum, Fred Armisen, will be on hand as Meyers' resident bandleader. So far the late-night changes are paying off. Riding the crest of NBC's Olympics coverage, "The Tonight Show Starring Jimmy Fallon" was seen by an average of 8.5 million viewers in its first week, the biggest "Tonight" audience in decades. Can the 40-year-old Meyers make the most of his popular lead-in? He comes to his new role as a talk-show host with demonstrated skill and appeal from his years as an "SNL" writer and performer. He is known as cerebral with a taste for topical humor, a TV star who doesn't hog the spotlight and enjoys playing the straight man. And while he has conceded that interviewing guests will be a new experience for him, off-camera he is quick-witted and comfortable engaging in lively conversation. Other potential pluses: Meyers' executive producer is Lorne Michaels, the comedy kingpin whose empire also includes "SNL" and "Tonight." And his producer is Michael Shoemaker, who stewarded Fallon's successful "Late Night" stint. Other "Late Night" guests announced for this week include Kanye West, Kelly Ripa, Brad Paisley, Lena Dunham, Ian McKellen and Patrick Stewart. Meyers told AM New York that he's not nervous about his monologue -- but is more concerned about the interviews. "For me, the biggest fear is interviewing because that's the farthest from anything I've done before. So hopefully the monologue, because of the writers we've hired, will have good jokes, and when that happens, I'll feel pretty good. And hopefully over time, I'll learn how to interview a little bit better."